Winter is almost here, and if I’m honest, it’s a time I look forward to all year long as a designer. When the cool weather comes creeping in, it’s an awesome opportunity to get cozy. I’m not just talking about cuddling up with someone you love but creating a cozier environment in the cuddliest places of your home. These tips will help you make the most of cozy opportunities this year! This is the time of year to bring out the blankets. Having them on-hand can help keep utility bills down and make everyone feel welcomed and ready for a cozy night in, sipping cocoa or a hot toddy. Pick blankets that complement your color palette and that are rich, luxurious fabrics like cashmere, faux fur, soft cable knit, and fleece blankets are excellent choices to get cozy in style. If you’re worried about sticky fingers, choose darker colors and materials that you can wash. Same goes for animal fur, choose colors closer to your furry friend’s coat, and ones that can be easily cleaned. Now, I’m not saying you have to have an abundance of blankets out everywhere and certainly, if you are sharing with pint-sized friends, they don’t all need to be luxurious. 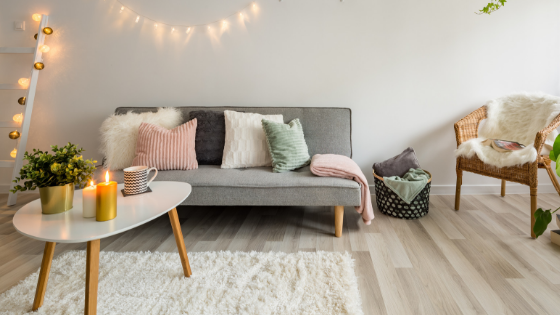 For décor, you can put out your nicest one or two blankets for a cozy look and feel, but for use, you can have the kid and animal-friendly blankets tucked away. This is another place décor can help. Think oversized ottoman with hidden storage, or bench seating, side tables that double as storage, or even add to your décor with stylish woven or canvas baskets to hide all that extra warmth away in. Not much reminds me of winters as a kid much more than the smell of a fire burning in the fireplace. Suddenly a forgotten part of the home becomes a centerpiece. How do you adjust to accommodate this focus? First, make sure if you have a fireplace and chimney, that it is cleaned and safe for use by hiring a chimney sweeper. Though this is all about making things look great, ensuring your fireplace is safe for use before starting that first fire is imperative. Then just a quick scrub around the brick or other stone that surrounds the fireplace itself is in order. Once you know you can use your fireplace again, think about the kind of fireplace screen you are using. This piece of functional décor can become a show stopper, especially when everyone is gathered around enjoying the warmth and closeness it encourages. Look for a modern design with elements that complement your current décor. If you have luxe design pieces you can really go for it with your fireplace screen, looking for ornate designs and heavy metals. We’re not done yet! Along with the fireplace and the screen, you can create a fun seating environment around the fireplace to make the experience more enjoyable. This may be as simple as just moving your current furniture around to make the fireplace center stage. If this will throw off the balance of the room or you just don’t want to deal with moving things around, let’s try something different. There is all manner of seating alternatives to armchairs and sofas. Bean bag chairs are certainly an option, and these aren’t the beanbags you remember from your childhood. They come in modern designs, they can be transformed into chairs with backs, and made of sturdier stuff. Just make sure not to get them too close to the flames, they aren’t meant to stand up to too much heat. Seating cushions come in firm and soft styles. Decide which is best for you or provide a variety to accommodate guests. Last, and maybe simplest, you can create an oasis of pillows that can be arranged however you would like. They can join your pillows in stylish storage as well. No matter where you live, drafts can always be a concern and frustrating part of winter. While the blanket suggestion will certainly help with this, there are a few other ways to combat drafts in your home that don’t require a piece of pool foam wrapped in a bedsheet. Ensure your doors and windows are insulated properly, using high-quality elements and a professional to install them. DIY just doesn’t yield the same final result. If the draft is coming from your doggie door, make sure to purchase one that is draft-free. There are many other opportunities to cozy up your space with other elements. Using a thick, luxurious rug for the winter months can make your space look extra inviting from the cold. Faux fur or a shag in a deep or jewel tone can do the trick there. Add some luxe fabrics to your current décor. This can be as simple as adding some velvet pillows or soft, rich fabrics as covers for your furniture. No fireplace? No problem. There are fireplace alternatives that you can use to still create the illusion of a fireplace to add to your already snuggle-ready winter wonderland. In the bedroom, you can add a fluffy comforter and layer it with a blanket folded at the foot of the bed. The fluffier the better for both. If you are looking to cozy up your space, whether your first or second home, I’ve got you covered. This is the time to order, vendors will be closing up shop soon for winter and won’t be available again until after the new year. I look forward to speaking with you soon!